Amanda has enjoyed many years working in the medical profession. She has been an office manager in orthodontics, general dentistry and family medicine. As a dedicated professional she strives to provide optimal customer service and care to each patient. Amanda lives in Katy with her daughter, Kaitlyn, two dogs, two cats and a fish! She enjoys spending time with her family, her granddog Zoey, any outdoor activities, cultural festivals, and experiencing new adventures. 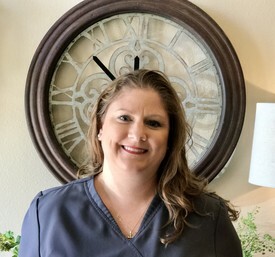 Amanda grew up in Livingston, Texas but has lived in Katy since 2000 and considers this home. 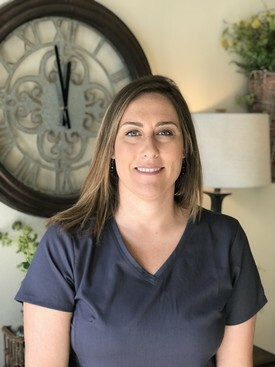 Erin started her professional career as a dental hygienist in 2005. She received her Bachelor of Science Degree in Dental Hygiene from The University of Texas School of Dentistry in Houston. Upon graduation she was inducted into the Sigma Pi Alpha High Honor Society. During her professional career she has worked in both pediatric and general dentistry. As a dedicated dental hygienist she strives to provide optimal dental care and oral health education to each patient. Erin lives in Katy with her husband, Jamie, and their two children, Bailey and Tristian. She enjoys spending time with her family, outdoor activities, baking and her favorite….relaxing. 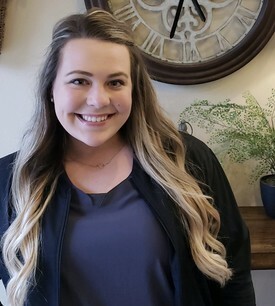 Rebekah has always loved going to the dentist and knew that one day she would like to work in the dental field. 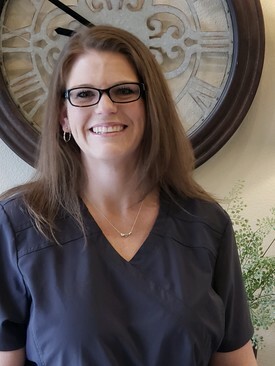 She attended Houston Dental Assistant School to become a dental assistant and has been a member of the Cinco Meadows Dental team for 4 1/2 years. Rebekah is a native to Katy, Texas. She is engaged to her wonderful fiance, Colby, and they have a sweet boxer named Katy. Heather began her journey in the dental field as a single mom looking for a career that would support her family. 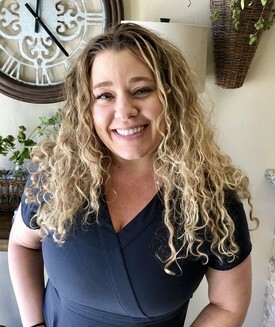 Her passion and curiosity for dentistry was instilled in her as a young child when she was taught the importance of oral hygiene. 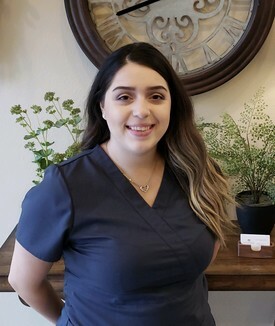 She says that choosing dental assisting for her career was the best decision and she absolutely loves her job! Heather has 5 kids, 4 boys and 1 girl. Outside of work she enjoys hunting, anything outdoors, bowling, baseball and other sports. And she always seeks to put God first! Sally has been a part of the team for almost four years. Sally's passion for dentistry and community outreach began at a very young age and is still evident today. She graduated from the University of Texas School of Dentistry at Houston with a Bachelor's Degree in Dental Hygiene in 2014. During that time she was awarded multiple honors in Academics, Ethics, Research, and Community Outreach. 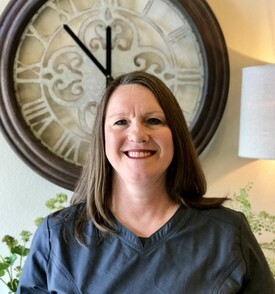 She also served as Committee Chair for Texas Mission of Mercy and Give Kids a Smile Day and was appointed to the Dental Hygiene Admissions Committee. In her free time she is active in community service and enjoys spending time with her boyfriend, Ken-O-Rama, and her cat, Harry. Cara DeLatin started practicing dental hygiene in 2007 in Louisiana after graduating from LSU School of Dentistry in New Orleans. Since then she has practiced in different offices in New Orleans, Baton Rouge, and her hometown, Shreveport. 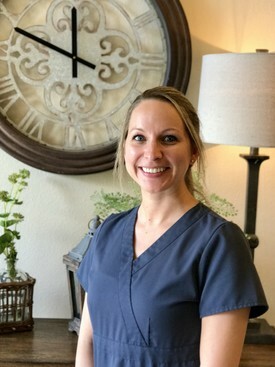 In 2011 she and her husband moved to Katy, where she began working at Cinco Meadows Dental. When not working she likes to spend time traveling and spending time with friends, her husband, and two daughters. Geaux Tigers!! Benay started out in the dental field almost 20 years ago not knowing what she was getting into. As a “first job,” she had no idea it would turn into such a rewarding and fulfilling career. She loves really getting to know the patients in the practice while always trying to go the extra mile to help out if she can. Just seeing a smile on a patient’s face is what makes this job worth it for her. Benay grew up in North Shore (in Houston) and moved to Katy in 2001. She lives with her 10 year old daughter, Riley, who is in the 5th grade and her fiancé, Nick, who works in IT. But the one that really runs the house is the 18 year old cat, Abbey, who hates everyone except for Benay, of course! In her spare time she loves spending time with family, shopping (too much! ), crafting and chauffeuring her daughter around to whatever activity she is into that week. They also watch a lot of Family Feud in their house! 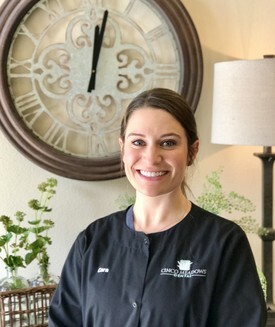 Sarah started her career as a dental hygienist in 2014. She received her Associates degree of Applied Science in Dental Hygiene from Lamar Institute of Technology in Beaumont, Texas. Upon graduation she was inducted into the Sigma Pi Alpha High Honor Society. She enjoys learning about new advances in dentistry. She attends educational courses regularly and has obtained her laser certification. From a young age Sarah knew she wanted to be a dental hygienist. God placed a desire in her heart to love people and to love and encourage smiling and laughter. Sarah enjoys spending her free time with her family, friends and boyfriend, Fabian. She loves her church, being involved in mission work and traveling. 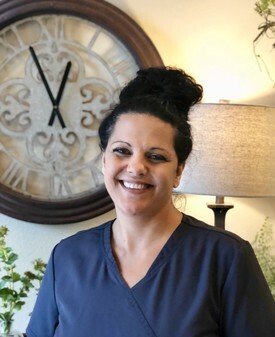 Andee has been a Registered Dental Assistant for a little over a year now. While she’s not making our patients smile and caring for them, she loves spending time with her family doing outdoor activities. She is a mother of 5 and considers them such blessings in her life.